Valentine’s Day is the one day during the year when it is encouraged to go all out for love! 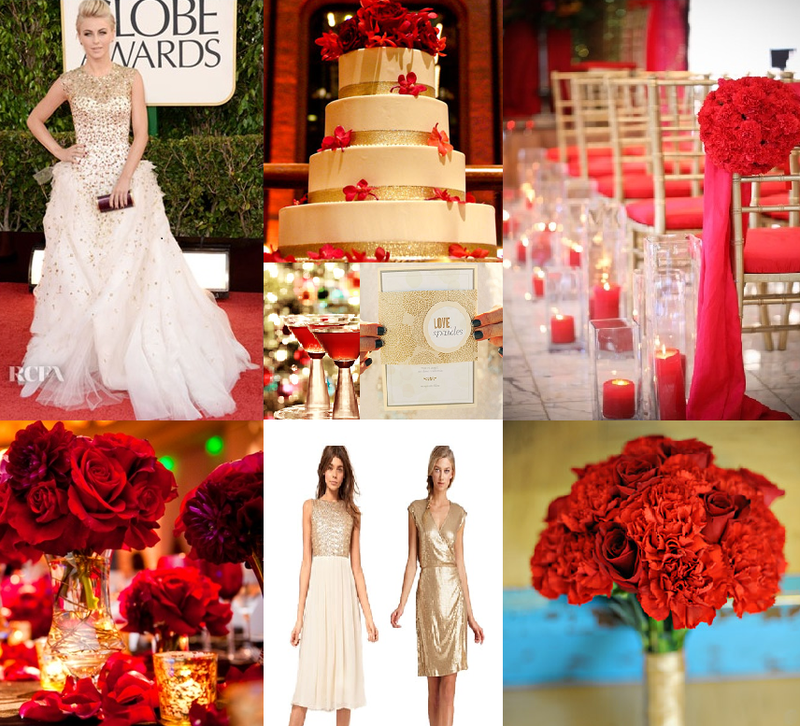 In that spirit, I put together a bold and glam inspiration board using bright red and gold as the main focus. The red and gold colors work so well together anytime during the year, but is really perfect for Valentine’s Day. My inspiration for the look of this board was the photo of the red and gold ceremony decor (upper right corner, southasianbridemagazine.com) . I love the monochromatic red that is happening with the lush flowers, fabric draping and red candles that line the aisle. I wanted to include a gown that could stand on it’s own next to these rich colors. The Monique Lhuillier worn by Julianne Hough to the Golden Globes is the perfect dress. Elegant, modern and fit for a princess. I picture her bridesmaids in shades of gold, with a little sparkle as well. To complete the look, I included beautiful red and gold details for the flowers, centerpieces, wedding cake, invitation and signature drink.